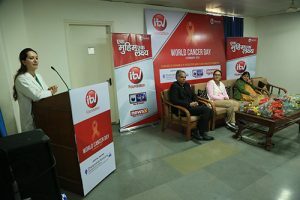 New Delhi : iTV Foundation, the corporate social responsibility (CSR) wing of iTV Network, commemorates world cancer day by organizing a health talk on the prevention of cancer disease, the event was organized on Monday at Dharamshila Narayana Superspeciality Hospital, New Delhi. The cancer prevention health talk was hosted by the team of superspecialist doctors of the Dharamshila Narayana Hospital to create awareness and education about the fatal disease and how treating cancer at an early stage can save lives. The event was attended by Mrs. Aishwarya Sharma, Chairperson, iTV Foundation along with senior doctors, specialists and cancer survivors. During the event, the specialized doctors hosted sessions on raising awareness on cancer prevention and how maintaining a healthy lifestyle, avoiding exposure to known cancer-causing substances, and taking medicines or vaccines that can prevent cancer from developing. The specialists discussed on how the disease can be cured in the early stages, if the diagnosed patient gets proper treatment. Oncologists of the Dharamshila Narayana Superspeciality spoke about specific type cancer like Dr. Anshuman Kumar spoke on head and Neck Cancer; Dr. Atul Srivastav discussed about Brest Cancer; Dr. Deni Gupta spoke on Lung Cancer; Dr. Satinder Kaur discussed about Cervix Cancer and its prevention and Dr. Kanika Sharma busted Myths related to Cancer. There was another special session which was led by some of the cancer survivors of ovary, Breast, Cervix, Multiple Myeloma, colon and other cancers shared their journey and how they have successfully won their battle against the disease. The initiative is an evidence of iTV Foundation’s commitment to provide quality medical care and create awareness about the fatal disease.